Students in this Journey will learn how to use continue and break to control the behaviors of loops. Moreover, the students will be able to construct nested loop structures to create more complex repetition logic in their codes. Adventure 1: Let's become familiar with this world of ice! Oh! Hello there! I'm new to this ice world. 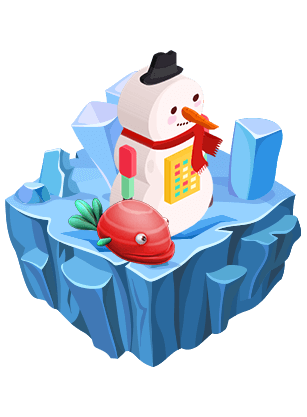 I'll start this adventure by getting to know the new environment by preparing my fishing equipment to do my favorite hobby, ice fishing! Great work, keep it up! Now let's collect all the fish we can, we need to feed the team. Awesome! I can't get enough of this! How about we start collecting some buckets to transport the fish? We have done it! We made it through half of our amazing journey. The best is yet to come! Be careful, you need to guide me using the fewest amount of code blocks. Let's get those paddles! We make a great team! I am having a blast here! How about we collect some more fish bait using the fewest blocks possible? Make sure to stay on course and be aware of the broken ice. Awesome! The team wants to go rowing in the lake. We will have to get the equipment ready. This has been amazing! I can't believe we have reached our last adventure of this Journey! Now we need to make our code less and reusable, let's make some functions.